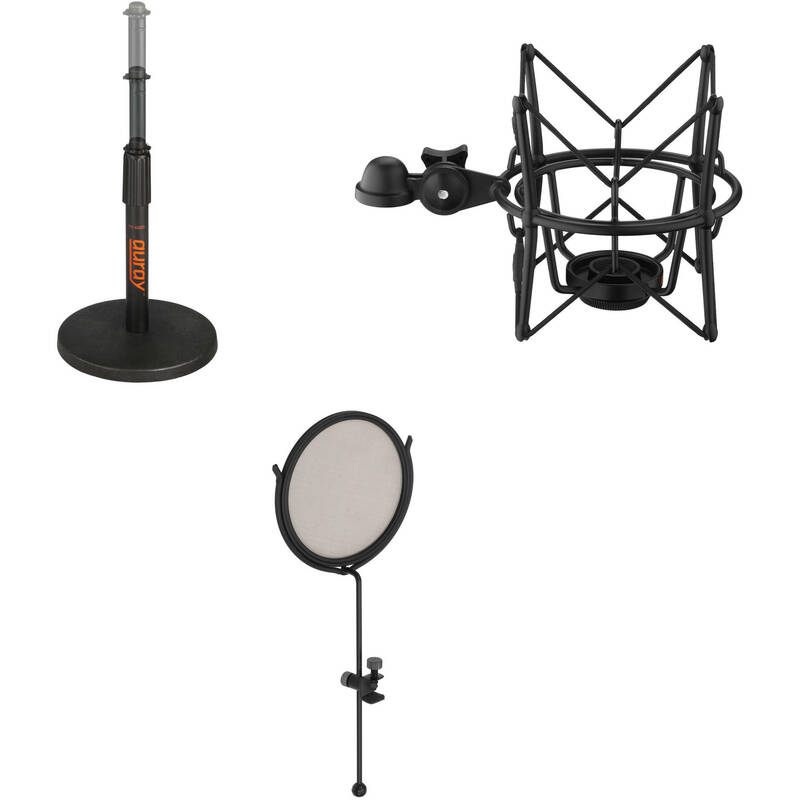 The black Auray TT-6220 Telescoping Tabletop Microphone Stand Kit from B&H includes the Auray TT-6220 Telescoping Tabletop Microphone Stand, the SHM-SCM1 Suspension Shockmount for large diaphragm condenser microphones, a 5/8 to 3/8" threaded adapter, and an MPF-3 Mini Pop Filter. This kit can be used to eliminate vibration and vocal plosives in desktop audio recording applications that require the use of a large diaphragm condenser microphone (sold separately) with a threaded post and a locking knob for precise angle adjustment. The SHM-SCM1 Suspension Shockmount for Large Diaphragm Condenser Microphones from Auray features a classic suspension shockmount design to eliminate vibrations from your mic stand that otherwise might reach your microphone. It is compatible with a wide range of large diaphragm condenser microphones with a threaded post and has a locking knob for precise angle adjustment. Its all-metal construction lends to its durability while its heavy-duty elastic bands suspend the mic in the shockmount's center for isolation. A 3/8" adapter is included. Designed to clamp directly to your shockmount to help minimize plosives and vocal noises, the MPF-3 Mini Pop Filter from Auray features a 3" fine metal mesh screen that is height and angle adjustable. Its light weight assures the shockmount will not be disturbed or move during recording. In addition to protecting your mic's capsule from corrosive moisture, the pop filter's see-through construction allows the vocalist to train their performance directly to the mic's capsule for clearly captured audio. Box Dimensions (LxWxH) 6.2 x 5.9 x 5.1"
Box Dimensions (LxWxH) 8.6 x 4.0 x 0.8"